A new photo captured by Artyom Anikeev shows Russia's new Sukhoi T-50 stealth fighter—the F-22 Raptor's nemesis. According to The Aviationist, its new camouflage—inspired by a typical white tip Red Sea's shark—will make it look "as a rhomboidal shaped aircraft, smaller than the actual airplane" from a distance. 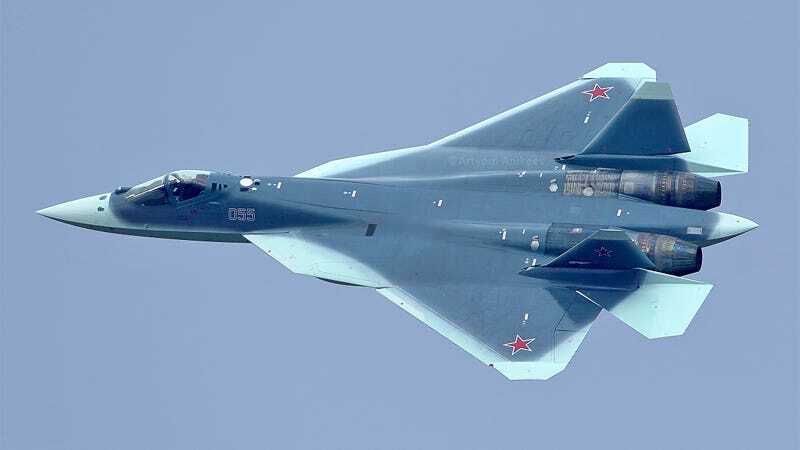 The Sukhoi T-50 is the prototype of the PAK FA, the fifth generation fighter that will replace the MiG-29 and Su-27. The dark shape actually looks like the concept by Aleksander Dultsev. Recent reports indicate that the T-50 could match and outperform both the F-22 Raptor and the F-35 Lightning II.